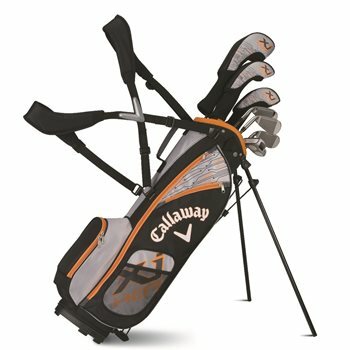 The Callaway XJ Hot Junior set is small in size only! It features all of the same technology that Callaway includes in their X Series for adult golfers. It provides the perfect combination of forgiveness and performance to help kids play with confidence. This set includes a 16-degree aluminum driver, 24-degree stainless steel fairway wood, 30-degree #5 hybrid, a 7-iron, a 9-iron, sand wedge, XJ Hot 2-Ball putter and a lightweight Callaway XJ Hot stand bag. What height junior is this set intended for? This set is recommended for heights ranging from 51"-61"